In here last Saturday for the first time in years and very disappointed. It’s just after 1.30pm and only two other customers. They have 7 hand pulls split 4/3 on each end of the L shaped bar. No less that FOUR have the Spitfire clip on them and one is blank (must have run out of Spitfire clips). One guest ale is from Clarence & Fredricks (new on me) American Pale Ale. I have a pint of Spitfire which is very average and costs £3.70. 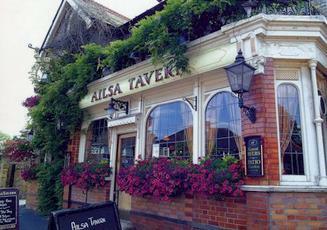 The pub I regard as my Local despite having a number of closer establishments in Isleworth. The Shepherds Neame is always the best I've had outside of Kent and there's a beautiful collection of malts behind the bar. The food has improved considerably in the last few weeks - I think they have a new chef on. Went along for the first Open Mic on Sunday night. Excellent evening!! No complaints about the pub, it was a friendly atmosphere and very busy. Recent comments about quality and choice of ale seem to be unfounded. Spitfire, Whitstable Bay and Canterbury Jack were on offer, the latter making a great session beer at 3.5%. Shall return again for the next Open Mic!! Rocked up, the only customer standing at the bar; air stale and stuffy. Pair of blokes behind the bar eventually condescended to stop chatting and serve me a very poor pint of Spitfire for 3.30. Locals in garden mixed; some middle class St Mags types, others massive-arsed with tattooed dog kind of vibe. I live locally but won't go back. The new managers have nearly been here a year now, and there has been a noticable dip in the quality (warm/flat) of the beer served and the selection of beers available has also narrowed. After another year, these small steps backwards, will have slowly turned this boozer into another high street chain with only fizzy lagers on offer & only 1 handpump for Spitfire. Where's that NZ guy?? - best cellarman in the business and years of experience. Fools to let him go, as it's effecting their end product. Wont go back in a hurry - too sad to witness this slow decline.